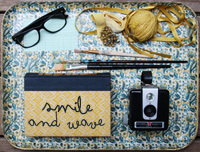 Smile and Wave: Modern Patchwork Is Coming Soon! Modern Patchwork Is Coming Soon! 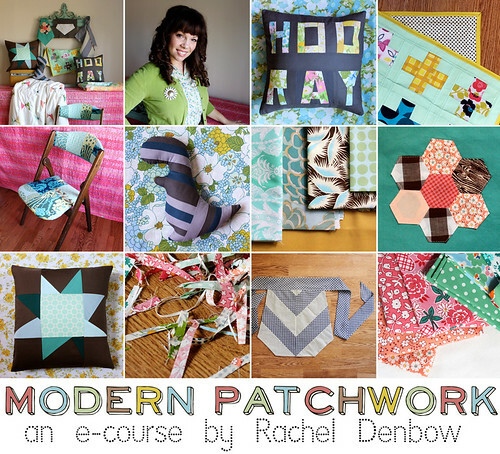 I'm so happy to finally be able to share my very first e-course, Modern Patchwork, with you! I've been cutting, stitching, and writing for weeks and it's finally available for purchase this Tuesday! 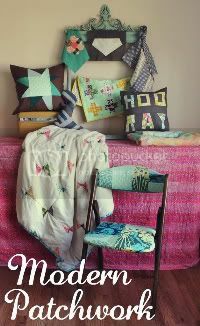 Modern Patchwork includes nine patchwork projects with step-by-step tutorials that build on each other so that even beginning sewers can feel confident in their ability to stitch together a colorful lap quilt and then recover an ugly chair! I cover all the tools you'll need, how to select and care for your fabrics, and a sweet story about my great-grandfather's star quilt in two videos, as well as my favorite binding technique and the simple steps involved in paper piecing. This class is designed for beginning sewers but even seasoned seamstresses will enjoy original templates for quilt blocks and one of my favorite projects, the Make A Statement Pillow. It's been refreshing to be able to spend time working on these projects. I now have about fifteen quilt ideas floating in my head since I've been back in my studio! If you've been looking for something to help you with that desire to sew your first quilt or the structure that keeps you on track to finishing something crafty you may want to check back on Tuesday! oh rachel...that sounds soooo good!!!! so excited!! what a way to start the new year! Hi Rachel, this sounds really really cool! I am a beginning seamstress and was wondering if you have any tips on which sewing machine to buy. I am currently looking into Husqvarna emerald 183 or a Bernina 330. Do you have any thoughts on the big brands like Singer, Pfaff, Husqvarna or Bernina? I would love your opinion! Absolutely fabulous! I can't wait to start! I'm so excited about this e course! Rachel! This looks amazing! I was just going through all of my fabric scraps thinking how I wished that I knew how to quilt! you're so talented. i'm sure this class will be awesome!! So excited about this. Thanks for putting this together! Oh my goodness, I am so excited for this class. On the other hand I am due with my first baby any day now. 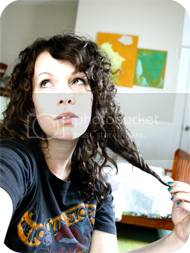 How long will you have the class up and running for slackers to finish it up? so cool rachel! good for you on putting it together on your own - i'm it's going to be fantastic! !